A few weeks ago, I mentioned that I am generally skeptical of “accepted wisdom” on many topics. “Accepted wisdom” is a construction of a stylized fact by a party with intense preferences that is gradually able to remove nuances over time to solidify its preferred narrative. The example I gave a few weeks ago concerned antitrust laws. There are many more. One of those concerns a research agenda that I laid claim to in a recent article in Atlantic Economic Journal (co-authored with my dear friend Germain Belzile): the nationalization of electricity in Quebec. My home province of Quebec is basically one giant network of rivers well-suited for the production of hydro-electricity – a potential that was noticed in the late 19th century and led to a rapid expansion of the network. Historians (and some economists) have depicted the early electrical industry in Quebec as a “trust” (a cartel) that gouged consumers and could only be resolved, as witnessed by the neighboring province of Ontario, by nationalization (which occurred in two waves – one in 1944 and one in 1962). In the article I published with Belzile, I argue that this narration is largely incorrect. First, before nationalization prices in Quebec were falling and were low by North American standards (see figures below). Second, production was expanding rapidly. This is in spite of the fact that taxes imposed on the electrical industry grew rapidly over time from less than 10% of total expenditures to close to 30%. Moreover, we point out that looking at residential prices is bound to yield bad comparisons (if we can call those made above as “bad”) if there is price discrimination. The industry price discriminated and offered incredibly low prices for industrial customers (large power) than in Ontario or anywhere else in Canada (in spite of the taxes it was operating under and the fact that Ontario subsidized its own). We also point out that there was a dynamics of interventionism problem. The neighboring province of Ontario (more populous and richer than Quebec) nationalized its industry and set prices well below the market level which is an implicit subsidy. However, at the subsidized rate, Ontario could not supply its own demand and had to buy at the market price in Quebec. Its over-equilibrium quantity of energy demanded was transferred on the freer Quebec market, thus increasing prices on that market. 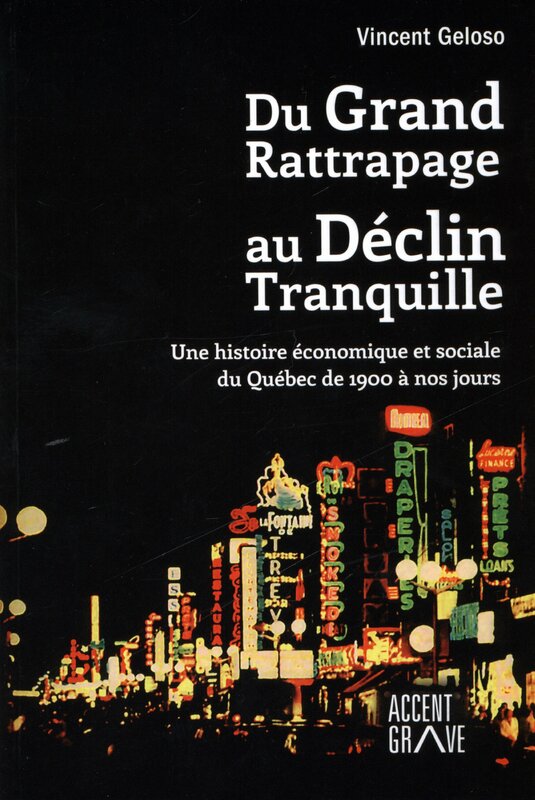 We also argue that there was wide heterogeneity of rates in Quebec that relate to the structure of municipal regulation (the level at which electricity was regulated pre-1935). The price differences depended on the political games involving rent-seeking firms and politicians (best exemplified by the case of Quebec City). Cities with high prices were places where the electrical market was heavily politicized and franchises (i.e. the contracts fixing rate schedules over long periods of time to recoup capital investment) were short and subject to holdups. This latter point is meant for us (me and Germain) to stake a claim on future research to document the nationalization and regulation process at the municipal level and see what the effects on prices and outputs were. 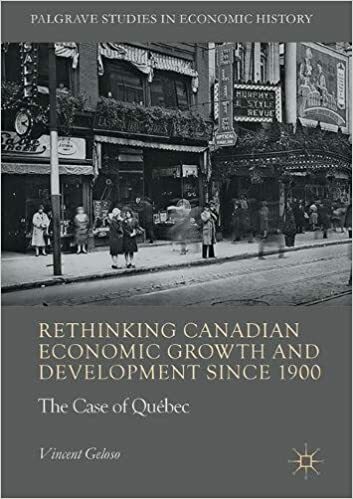 In a certain way, I am trying to establish a research agenda extending the skepticism of “accepted wisdom” that has emerged with the economic history of antitrust in the United States to the case of electricity trusts in Quebec. This first article is, I believe, a promising start for such an inclusion. One of these days Brandon’s going to kick me off this blog for posting notes that aren’t “on liberty.” But maybe he’s not looking. I’ll take a chance. This piece is about energy and on second thought, it is relevant to libertarians. We need to know what we’re talking about when we enter into controversies on current topics like energy. Insights into how markets work are crucial, of course, but not sufficient. We should arm ourselves with a few facts and Lord knows, maybe even a little understanding of basic physics. I base my remarks on an excellent chart produced by (gasp!) a government agency, Lawrence Livermore National Laboratory. It appears here but if it’s illegible please find a better copy here. Blame Brandon for squeezing our posts into a narrow column! 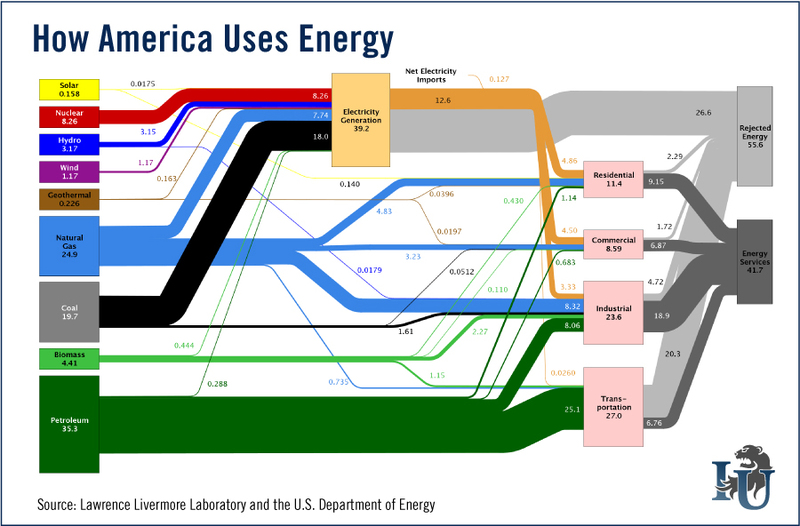 We see energy sources on the left. A couple of facts stand out. At the top, notice that solar and wind are negligible. The yellow line representing solar may be thinner than a single pixel on your monitor and therefore invisible. Geothermal is on the radar, but barely; same for biomass (wood chips, organic leftovers, corn used for ethanol instead of feeding people) that can either be burned or processed into methane or ethanol. Our three main sources are, and will be for the foreseeable future, petroleum, coal and natural gas. At the top center we see electricity generation. We don’t consume electricity directly except maybe for executing criminals. We use it to power devices in the four broad categories shown on the right: residential, commercial, industrial, transportation. Notice the fat grey line coming out of the electricity generation box called “rejected energy.” It tells us that about two thirds of the energy coming into power plants goes up in smoke or steam or other waste heat rather than electricity. That sounds like a terrible loss and indeed, there is always room for efficiency improvements at the margin. But, boys and girls, there’s something called the Second Law of Thermodynamics which puts an iron limit on how much energy in a particular situation is available to do useful work. In other words, a certain amount of the “waste” represented by that fat gray line is inevitable. It would be great if the good people at LLL could supply that calculation, but I suspect that reliable estimates of the necessary data would be difficult to come by. Look at the residential box on the right. It only represents 11% of energy consumption meaning that relative to the big picture, home energy efficiency measures like insulation, solar panels, etc. can never do much for the big picture. I say this too keep things in perspective, not to deny the possibilities for cost-effective marginal improvements in many homes. If your monitor resolution allows it, you’ll see a tiny orange line running from electricity generation to transportation. That means electric vehicles are, and for some time will be, utterly insignificant, though again, marginally beneficial in very special situations. The overall message of this chart is: if we want to maintain anything like our present industrial civilization with its abundant heat/cooling, light, transportation, etc., we’d better keep the present main sources going – petroleum, coal, natural gas, nuclear because renewable energy sources are advancing only slowly and in many cases (wind and ethanol, especially), uneconomically. The stakes couldn’t be higher – significant losses of energy, more than anything short of nuclear war, will make life nastier, more brutish, and shorter. Speaking of costs and benefits, one of these days I’ll comment on the strange notion that energy accounting – a perfectly legitimate engineering practice – should be used to judge the economic value of energy projects. Tallies of income/expenses and assets/liabilities, should, say proponents, be carried out not in dollars but in energy units (joules or BTUs.) Why is this wrong? Because the economic value of a joule depends on time and place and most critically, people’s ability to make good use of it. In fact, natural resources aren’t resources at all until and unless someone figures out how to make good use of them. More generally, value never inheres in physical objects and materials but only in the minds of people who believe those objects and materials can help satisfy wants, theirs or others’. Postscript: The oceans store unimaginable amounts of thermal energy. You can calculate this yourself: using your favorite system of units, just multiply the volume of water by its mass density by its specific heat at constant pressure. You’ll discover that if we were willing to lower the ocean temperature by a thousandth of a degree per year, we would have abundant energy from now till Kingdom Come. Try this idea on a “progressive” friend sometime, keeping the answer momentarily in your back pocket: the Second Law forbids it. Stated differently, even with perfect technology, you would have to put more energy into the conversion process than the usable energy end product. Recently there was a bad fire at the Chevron refinery in Richmond, CA, as you probably know. The refinery will be offline for an unknown period, probably months. Upon reading this, and knowing that the CA government prohibits “imports” of gasoline from other states, I knew the retail price would jump. I made a mental note to fill up my Thunderbird next morning. Too late – regular had jumped from $3.85 to $4.01. This morning it was $4.06, and $4.13 by afternoon. Please ask Chevron to explain why the cost of gasoline will go up because of an accident at their plant. Don’t they have insurance to cover the loss of their equipment? Is Chevron going to recoup the lost income (deducted from the billions of dollars in profit that they make every year) from us? If the accident was determined to be due to Chevron’s negligence, are they going to compensate all of their neighbors “inconvenienced” by this? But most of all, please ask all the other oil companies why their costs are going up because of a fire at a Chevron refinery. If the other companies are not suffering a financial loss from this devastating environmental disaster in the Bay Area, why are prices expected to rise at Exxon-Mobil, Royal Shell Dutch, BP (Arco, lest anyone forget) and any other company I might be too angry to remember at this moment? I might have to hold my breath until you find out the answers to these questions or until the air clears, whichever comes first. I’ll let you guess which one that will be. Chevron probably doesn’t carry insurance because they are big enough to be self-insured, and the risks may be too large and uncertain for an insurance company to estimate. But insurance is irrelevant to retail pricing. The basic problem is the all too common myth on which this letter is based: that cost determines price. The myth is that suppliers add up their costs and then tack on as much profit as they think they can get away with. As anyone who has studied economics should know, supply and demand jointly determine price in a competitive market such as gasoline. Set your price too high and you lose customers and your profit declines. Set it too low and your margin declines, and you may sell out your supplies. The sweet spot varies constantly with shifting supply and, to a lesser extent, shifting demand. Of course, profits benefit Chevron’s shareholders. But they are vastly more valuable to Chevron’s customers because they are the driving force (putting aside government interference) that tells Chevron what kind of products we want, where they are offered, how they are delivered, etc. Of course, government interference is substantial and shouldn’t be set aside. Politicians worried about rising gas prices could help out by lifting the prohibition on imports. The BP-caused oil spill – going on for more of a month as I write – is also a public relations disaster for the corporation. As I said earlier (“The Louisiana Oil Disaster?” Posted 5/21/10), we are still missing the moving photographs of thousands of dead, soiled aquatic birds. There is in and around Plaquemines parish a group of stake-holders that is becoming increasingly vocal: The fishermen. I heard some on NPR on 5/25/10 complaining that BP has mostly ignored their wishes to “volunteer” to help. It sounded true and it sounded incredible to me.